Affordable high quality power cord with molded plugs. The conductor is of our famous high purity 6N copper and fitted with high quality double molded US 3P and IEC female plugs. Both the connecting blades and receptacles are plated with extra thick, highest grade rhodium. A drawback of conventional molded plugs is weakness in holding the blades. We often see loose blades and deformed receptacles. Acrolink has developed a very firm double layer molding process for 6N-PC4023. Blades and receptacles are first molded with very hard polypropylene to rigidly hold them in place, and a second layer of high polymer polyolefin is applied for the best dielectric characteristic. 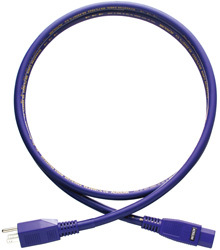 This technique provides exceptionally strong and secure connection with extra long life, and all important elements are of the highest quality as with all Acrolink products.